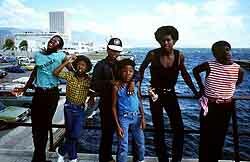 Musical Youth are a British-Jamaican pop/reggae band. The group originally formed in 1979 at Duddeston Manor School in Birmingham, England. The group featured two sets of brothers, Kelvin and Michael Grant, plus Junior and Patrick Waite. 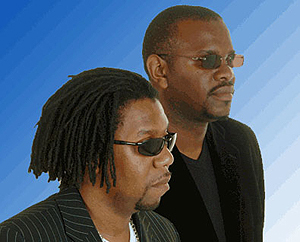 The latter pair's father, Frederick Waite, was a former member of Jamaican group The Techniques, and sang lead with Junior at the start of the group's career in the late 1970s. They were quickly signed to MCA Records and by that time, founding father Frederick Waite had backed down, to be replaced by Dennis Seaton as lead singer. They are best remembered for their successful 1982 Grammy-nominated single, 'Pass the Dutchie.' Indeed, they received a Grammy Award nomination for Best New Artist at the Grammy Awards of 1984. Still releasing albums, still playing live, I recently had the opportunity to chat one-on-one with original lead singer Dennis Seaton - and asked him all about his career, his earliest TOTP memories, his honest thoughts on the 'Dutchie' song, and, of course, ... penguins! 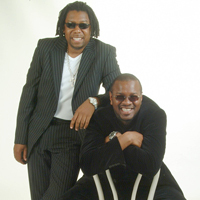 Taking it from the top, and Musical Youth were actually formed in 1979 by Frederick Waite (sr.), who quickly discovered that his sons Patrick and Frederick (jr.) were talented musicians. Then both Grant brothers joined the band, Kelvin and Michael, before you yourself were brought in as the lead singer. Looking back to those days in 1979, can you remember when you were asked to front the band - where were you, mentally and physically? "My claim to fame is that I was at the very first rehearsal for Musical Youth but FW Snr didn't like me for some reason and banned me from any further rehearsals. I was asked by FW Jnr after we went a school club called Wednesday club." Although schoolboys, one and all, you still managed to score HUGE with your debut single, 'Pass the Dutchie' in the autumn of 1982. Based on the Mighty Diamonds 'Pass The Koutchie' (a song about cannabis), you subtly altered the title to feature the patois 'dutchie,' referring now to a type of pot used for cooking! But this song was way more than just (still) a possible (underlying) tale of cannabis smoking, as the lyrics repeatedly reinforced throughout the political and economic overtones about extreme poverty within the world. Back then was the whole group of you schoolboys really that into such political and economic standpoints / viewpoints, or were songs being written for you and you found yourselves to be, well, musical puppets? "We all understood what was happening around us as the country, at the time, had very high unemployment levels and the first single, before 'Dutchie' was a song called Political & General. I would be lying if I said that we had songs written for us but we fully understood the economical situation around country and the rest of the world. We were never musical puppets because the band wouldn't have been able to function in this format." And, come on now, after all these years, can you finally admit that you all knew exactly what you were singing about re: that the "passing of the dutchie" was still (although legally flying under the radar) a metaphor for the original 'Koutchie' vibe - if one cared to look deep enough, of course! "It would be ridiculous for us not to know what a Kutchie pipe was because we are all of West Indian extraction but in changing the lyric to Dutchie the issues of the song changed completely. So we deliberately changed the lyric because could you imagine the brouhaha it would have created should it be known that we were singing about smoking cannabis out of a massive great big bong? To be honest it has been a debate that has given the song its, almost, mythical complex as in the US people believed it was a pro ganja smoking song that could have influenced the likes of 'Cypress Hill' with their seriously weight smoking tunes. LOL." 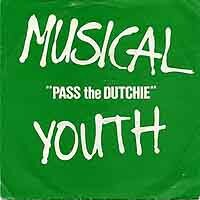 'Pass the Dutchie' reached #1 on the UK Singles Chart and went on to sell over four millions copies - and was nominated for a Grammy! How did all this sudden new-found fame and media frenzy sit with you boys back then - did you all handle it well, or could/should things have been done differently? "With the world wide success of Dutchie we were thrust into a situation that every band in the world wants to have, the only difference is that we were all minors. The rules changed slightly because we had to help each other out in dealing with the madness because one week you're driving around the country in a minibus and the next week you're flying to different parts of the world." "To be honest we all had no preconceived ideas on how fame would be handled because it was only ever about playing as many gigs as possible. Obviously hindsight is a wonderful thing but we were dealing with unknown territory of musical success on a world stage but yes there are some aspects of our new found fame could have been handled much better." The band released several more singles over the next three years - 'Youth Of Today,' 'Never Gonna Give You Up,' and 'Unconditional Love' - but come 1985 and the band split up. What happened back then? Why did things implode within the band so quickly? "Well what happened was that we all grew up and had different ideas on what we wanted to do in our lives, the manager didn't know how to take the band further and didn't seek out the right person or company to help him capitalise on the bands popularity." "Band members ie: me, started bickering over the silliest things which then became personal and coupled with only being able to work for 42 days a year. We really got frustrated with the whole situation and I decided to leave the band in 1985 and it wasn't until 1986 that the Grant brothers left the band." Then, in 2001, the band reformed, but the set of shows scheduled for the Here & Now tour of that year were cancelled due to the 9-11 attacks. Sadly, and according to your website, original band members Freddie 'Junior' Waite has since suffered a nervous breakdown, Kelvin Grant also suffers from psychological problems, and Patrick Waite died at age 24 from heart problems! My God, it's like some form of curse was put upon the band! Do you ever feel like this, that things didn't end fairly for the band, perhaps? "Kelvin was supposed to come on the road with me but due to his erratic behaviour I decided to just work with Michael as he was more interested than Kelvin. It was ashame that the tour got cancelled but it spurred Michael and myself to carry on and do some live shows together because that's what we started out doing. We have now toured the West coast of America, Slovenia some live shows in Netherlands and Germany. Things took a natural course for the band and subsequent events haven't helped but then that's 'Rock 'n' Roll' as they say!" Now down to just yourself and Michael Grant, being older, wiser, how is it performing those songs of old today - your once-fellow band mates (save Michael) not there with you as a whole? "I love performing the songs because they were of a time when we enjoyed playing our songs but I love performing them just as much now because they are also great songs and reggae is a special kind of music that cannot be faked as it has to come from the heart and soul of the band playing the music." You also have had solo success and formed the band XMY - what does XMY (my guess is 'Ex-Musical Youth') stand for, and are you still recording with XMY? "XMY is a project I put together to help me to go out and perform under the radar. It does stand for Ex-Musical Youth and it was also a 5 piece band which is now down to a duo, as we lost our keyboard player 3 years ago. Our guitarist emigrated to Brisbane, Australia, the drummer and the bass player currently play with Michael and I in the Musical Youth band." After all that '80s/'90s pop fame whirlwind wound down, it seems to me (from press now that relates to it back then) that you were actually kinda relieved - was that the case at the time? "I would have to disagree as there is nothing more than I would like than to be performing with my original band mates but I also knew that it couldn't go on the way it was going. I found Jesus Christ as my Lord and Saviour which helped me adjust to my life outside of the spotlight." If asked to record one for charity, what '80s (and possibly cheesy!) pop/rock song would you love to cover today...and why? "The song I would choose would 'House of fun' by Madness - as it is full of nothing but fun." 'Youth of Today' - "Being youthful individuals!" 'Never Gonna Give You Up' - "5 guys on a bench!" Different Style - "5 guys having fun!" Are you still doing these ongoing '80s revival tours? Something like the Rewind tour, the Regeneration tour, the Here & Now tour, etc? And, will the band ever come over and play any US gigs, perhaps? "LOL, yes, we still perform at 80's reunion shows as we are a band from the 80's and who else could perform 'Dutchie' better than us!!! As for playing in the USA, we are working on a new album and hope to do some live shows in the next 18 months after the release of the album." What more can you tell me about this new Musical Youth album? And, as we're not called Exclusive Magazine for nothing, has it got a working title at this time, perhaps? "No, there is no working title for the new album yet - but I am keen on a working title of Reggae For The People." Fun Five - OK, it's now time to fire off some quick questions - to allow those that think they know Dennis Seaton (Musical Youth) to perhaps think again! a) Can you remember your very first TOTP appearance? What song/year was it and at what level of nervousness were you at that whole day? "Our first TOTP I remember was when we did the christmas version and it like being at an all day party. We were never nervous even though we were in front of millions of TV viewers and hopefully we came across as having fun?" b) Is there one of your songs that you look back on and would today change the title to, or a line/lyric from it - and if so, which one, and why?! "Now this is a very hard question to answer but I can honestly say there isn't one song or lyric I would change because the majority of our songs reflect the band and its personality apart from 'Let's Go To The Moon'." c) Do you have a recurring nightmare or dream - and if so, how does it usually end? "Nah, I don't have any recurring dreams or nightmares but I do have dreams and aspirations. The main thing is that I am able to pass on the knowledge I have gained throughout all these years can be passed on to my family, friends and any musician who wants to learn about being a successful artist." d) What is your sweetest, guiltiest pleasure (food wise!) late at night? "That's easy, hot APPLE PIE!!" e) If you could meet any deceased celebrity, who would it be - and what would be the first question you would ask them? "Robert Nesta Marley and my first question would be do you fancy a game of football, that's soccer to you, because I know how much Bob loved football. Then I would just hangout with him and play some sweet reggae music." Lastly, and throwing you a journalistic curve ball, Exclusive Magazine loves Penguins (the flightless bird, not the chocolate bar!) ... do you? "My, this is a curve ball! I guess if EM loves Penguins then I will have to love them too!"